When I first saw this at Cog Magazine‘s ( @cogmag ) blog, I thought it was a joke. Then I read their post and followed the link to Lakefront Brewery‘s homepage. Sure enough, it’s a legitimate beer that’s brewed blocks from Cog’s headquarters. When I was in Milwaukee, I had Lakefront’s Wheat Monkey and it was pretty damn good. 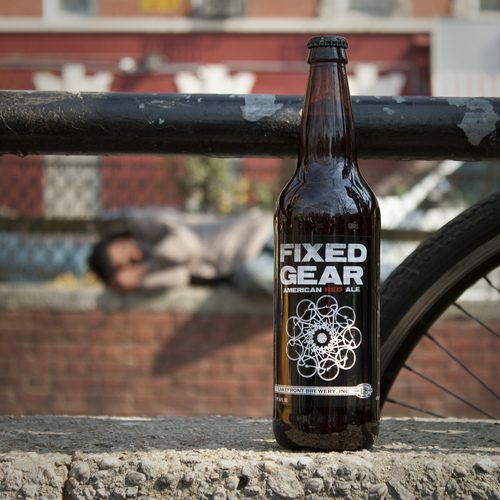 I’m sure their Fixed Gear Red Ale hits the marker too. Peter from Cog brought a few cases with him from Milwaukee this weekend. They were handing them out at the Bench Minor polo tournament here in NYC and I picked up a bottle. It’s sitting in my fridge at home. I’m still trying to decide to drink it or to keep it around for a bit. Knowing me, the second my Budweiser is gone, I’ll crack open the bottle. If you’re in Milwaukee, make sure to tour the Lakefront Brewery. I’m sure it’s well worth it!